This is an example of a combination of unusual genetic conditions expressed in fishes and other organisms. Xanthochroism is a condition where all pigments other than yellow and orange are absent or minimally expressed. Melanism is an excess of dark pigmentation. 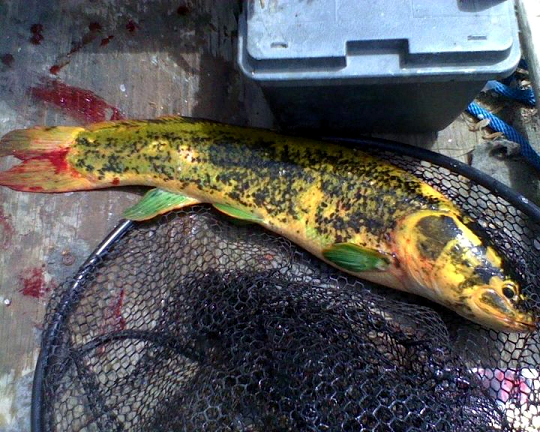 This fish is a combination of the two conditions; it has previously been observed in gars, and the combination of colors seems to be most apparent during spawning season. This entry was posted in bowfin, photos and tagged bowfin, fish photos, primitive fish, unusual fish by Solomon R David. Bookmark the permalink.